If you are looking to find Elkay products quickly and easily, you’ve come to the right place. This Elkay EZH2O EZS8WSSK Stainless Steel Drinking Fountain with Bottle Filler is a direct replacement product manufactured by Elkay. 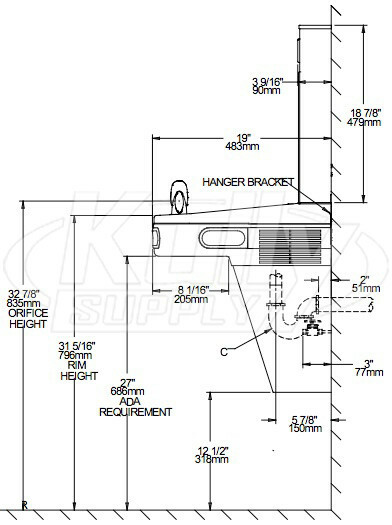 Order this Elkay EZS8WSSK today and you will have your Elkay project completed in no time at all. The Elkay EZH2O Bottle Filler Series is Elkay’s most popular bottle filling station. 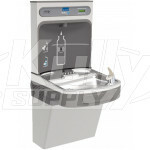 The Drinking Fountain and Bottle Filler are combined into one space saving and ADA (Americans with Disabilities Act) compliant unit. 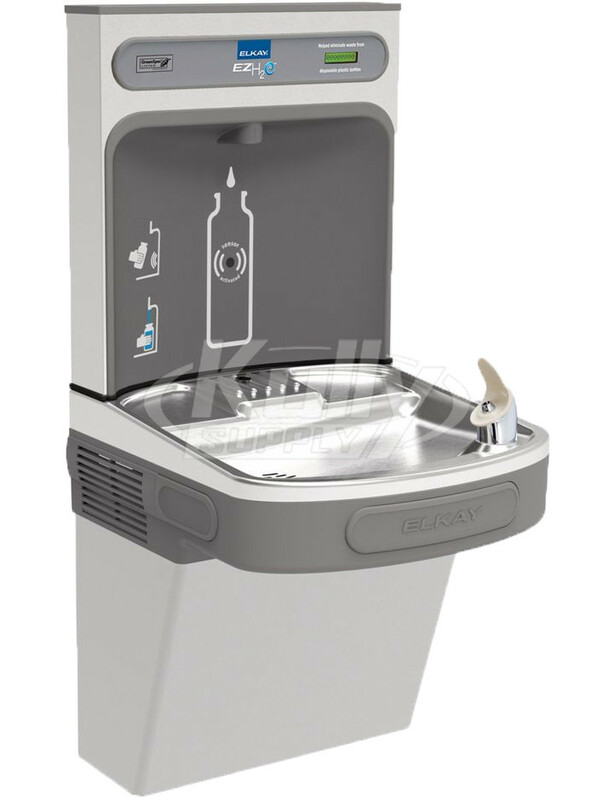 The Drinking Fountain features a Flexi-Guard Stream Saver Safety Bubbler, Integrated Silver Ion Anti-microbial Protection in key areas, and convenient Easy-Touch pushbars. The Bottle Filler is activated by a sanitary, touchless sensor with auto 20-second shut-off. The Quick Fill Rate of 1.1 GPM (gallons per minute) will fill re-useable bottles quickly and without splashing. The Green Ticker will keep a count of just how many bottles you have helped save from the landfill. 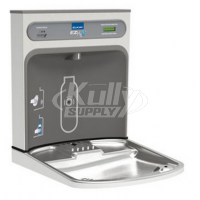 There is one cooling unit that provides water to both the drinking fountain and the bottle filler. Flexi-Guard Safety Bubbler: Utilizes an infused anti-microbial pliable polyester elastomer to prevent accidental mouth injuries. Flexes on impact. Compressor: Hermetically-sealed, reciprocating type, single phase. Sealed-in lifetime lubrication. Condenser: Fan cooled, copper tube with aluminum fins. Fan motor is permanently lubricated. Cooling Unit: Combination tube-tank type. Self-cleansing. Continuous copper tubing with stainless steel tank. Fully insulated with EPS foam which meets UL requirements for self-extinguishing material. Refrigerant Control: Refrigerant R134a is controlled by accurately calibrated capillary tube. 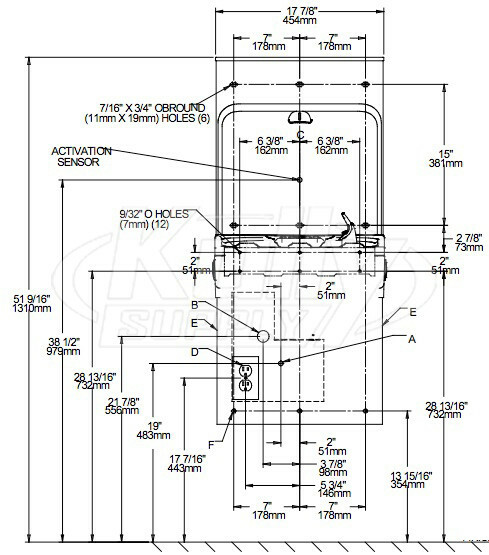 Temperature Control: Easily accessible enclosed adjustable thermostat is factory preset. Requires no adjustment other than for altitude requirements.